Another recipe swap = another recipe of Gianna’s! Last time I got her recipe for garlic roasted potatoes…this time, she shared a family recipe that I was lucky enough to receive. And although I served it with pasta, I bet the two would go really well together. 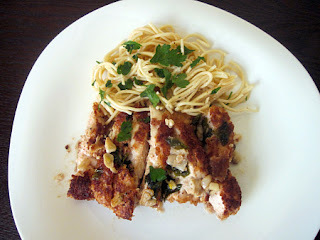 There are so many recipes for lemon chicken out there, but Gianna’s is one of the best I’ve tried. I lightened it up a bit (cut back on the oil and butter) and it was still delicious. This will be a keeper in our house! Preheat oven to 375 degrees. Dip each piece of chicken in flour, followed by egg, then bread crumbs. Heat oil in a skillet, then add chicken and remove when fully cooked (leave oil in pan). Slice into small strips and set aside. In the same pan, add garlic, lemon juice, wine, butter and parsley. Cook until mixture is hot. In a baking pan, put 1-2 TBSP of juice just to coat the bottom. Add one layer of chicken strips. Pour some juice over it, then add remaining chicken (if any), followed by the rest of the juice. Place in the oven for approximately 10-15 minutes, until all ingredients are heated through…do not overcook. This entry was posted in chicken, lemon, main dishes. Bookmark the permalink. Great surprise my two favorite foods chicken and pasta. Whats the next swap? This sounds pretty straight forward and full of flavor. Wine and butter in the same dish…I am sold! Thanks for linking up to Hunk of Meat Monday. What type of wine would you recommend using in this dish? I’m always confused when a recipe calls for wine. Hi Delilah! I used a dry white wine (Greco di Tufo – my Italian cousins make it!) so I’d suggest that.